Gerald Edward Colver, 68 of Palmer Township, passed away Thursday November 2, 2006 in Sacred Heart Hospital, Allentown, PA.
Born: On August 27, 1938 in Easton, he was the son of the late Roy and Evelyn Milburn Colver. Personal: Gerald and his wife, the former Rita M. Issac, celebrated their 40th wedding anniversary on May 7th. He was employed as a director of the Lafayette College Bookstore for 31 years until retiring in 1999. 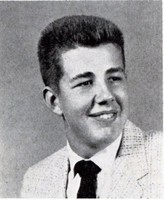 Gerald was a graduate of Easton High School class of 1956. He also graduated from Lafayette College Class of 1965 with a bachelors degree in history and later earned a master’s degree in history from Lehigh University in 1972. Gerald served in the Army during peacetime. Membership: He was of the Lutheran faith. Gerald was a member of the Middle Atlantic and National Associations of College Stores. He volunteered as a coach and commissioner for Palmer Township youth basketball and baseball for many years. Survivors: In addition to his wife, Gerald is survived by sons, David and wife Lisa Colver of Palmer Township, Timothy and wife Josette Colver of Allen, Tx and Thomas Colver of Allen, Tx; and five grandchildren, Paige, Morgan, Griffin, Sophia and Jocelyn. Services: Services will be held Monday at 10 a.m. in the Morello Funeral Home, Inc. 3720 Nicholas St., Palmer Township. Calling hours will be held Sunday evening from 6 to 8 p.m. and again on Monday from 9 a.m. until the time of the service in the funeral home. Interment will be in Northampton Memorial Shrine, Palmer Township. Online condolences may be offered at www.morellofuneralhome.com. Memorials: Memorials may be made to the American Cancer Society, 3893 Adler Place Bethlehem, PA 18017 in memory of Gerald.